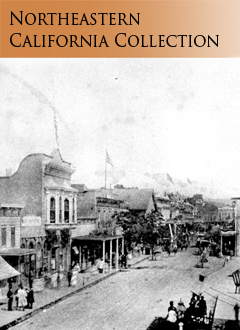 This collection of books, periodicals, and documents reflects a comprehensive record of the history, geography, and culture of the twelve counties comprising northeastern California. The collection includes city and county government documents, budgets, grand jury reports, environmental impact statements and general plans. Other subjects of the collection include industry and transportation, agriculture, forestry and mining, recreation, tourism, family and oral histories, and Native American studies. The contents of the Northeastern California Collection are listed in the Meriam Library Catalog and will be identified by the location "Special Collections N.E. Cal - 3rd Fl." Some materials have been or are being digitized, please the N.E. California Collection in Chico Digital Collections. For information about Meriam Library’s efforts to document the November 2018 Camp Fire through storytelling, please visit the Camp Fire Oral History Project.